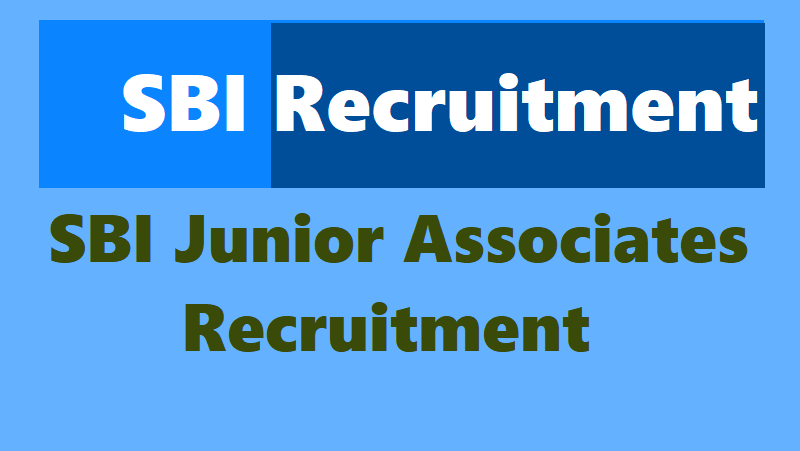 SBI Clerks -/Junior Associates Recruitment 2019 / SBI Clerk Recruitment Notification For 9633 Vacancies / SBI Clerk Notification Selection Procedure: SBI Clerk Posts 2019/SBI Junior Associate Recruitment 2019 notification: SBI State Bank of India has published the Clerical Cadre posts 2019 recruitment notification and applications are invited from eligible Indian Citizens for appointment as (i) Junior Associate (Customer Support & Sales) in clerical cadre in State Bank of India. SBI Clerk Posts 2019 SBIJunior Associates,Junior Agricultural Associates Recruitment 2019 notification, online application form, how to apply, last date for apply online, Selection procedure, exam date, admit cards, results details provided here. State Bank of India invites applications for appointment as Junior Associate (Customer Support & Sales) in Clerical cadre. Online registration of application and payment of fees: 12.04.2019 to 03.05.2019. Preliminary Examination will be conducted tentatively in the month of June 2019. Main Examination will be conducted tentatively on: 10.08.2019. State Bank of India (SBI)'s Central Recruitment & Promotion Department has notified the recruitment of Junior Associates (Customer Support and Sales) or Clerks in the bank. To fill the regular and backlog vacancies. According to the notification released on April 11, 2019, the online registration for 8,653 SBI Clerk 2019 exam will start from today i.e. April 12, 2019. The last date to apply for the SBI clerk recruitment is May 3, 2019.. Candidates are advised to check Bank's website https://bank.sbi/careers or https://www.sbi.co.in/careers for details and updates. Applications are now invited from eligible Indian Citizens for appointment as Junior Associate (Customer Support & Sales) in clerical cadre in SBI. According to the notification, candidates can apply for vacancies in one State only. Candidates can appear for the test only once under this recruitment project. The candidates applying for vacancies of a particular State, should be proficient (reading, writing, speaking and understanding) in the specified opted local language of that State (mentioned in the under given vacancy table against each state/UT). Graduation in any discipline from a recognised University or any equivalent qualification recognised as such by the Central Government as on 01.01.2019. Candidates having integrated dual degree (IDD) certificate should ensure that the date of passing the IDD is on or before 01.01.2019, said the notification. Those candidates who have integrated dual degree (IDD) certificate should ensure that the date of passing IDD is 1 January 2019, clarifies the recruiting body. Before applying candidates must ensure that they are proficient in the language of the State. A test to check the proficiency of the candidate in the local language will be conducted, after the main exam. The final appointment of candidates will depend on the performance in this test. In an exception, those candidates who produce certificates (class 10th or 12th mark sheet) proving that they have studied the particular language won't have to take the test. Aspirants should note that ex-servicemen with matriculate qualification who have obtained the Indian Army Special Certificate of Education (or corresponding certificate in Navy or Air Force) are also eligible to apply, provided the certificates should be dated on or before 1 January 2019. While for SC/ ST category there's 5 years of age relaxation, it is 3 years for OBC category. Widows, divorced women and women judicially separated from their husbands and not remarried will get an age relaxation of 7 years. In such cases the upper age limit for females in general category is 35 years; it will be 38 years for those in OBC category and 40 years for SC/ ST category. Age Limit (As on 01.04.2019): Not below 20 years and not above 28 years as on 01.04.2019 i.e candidates must have been born not earlier than 02.04.1988 and not later than 01.04.1996 (both days inclusive). India's biggest bank State Bank of India (SBI) has released the official notification for recruitment of clerks or Junior Associates (Customer Support and Sales) today and the online application process is set to start from tomorrow. With more than 9000 vacancies open for recruitment, SBI has come up with one of the biggest recruitment of the year. This is one of the biggest opportunities for the banking job aspirants in the country. SBI Clerk recruitment 2019 online registration will begin from January 20, 2019 and will continue till 10 February 2019. The candidates may access the details of the SBI Clerks recruitment details from the the official website of the bank at sbi.co.in. The selection process will consist of on-line test (preliminary & main examinations), test of official and/ or local language and subject to Government of India approval, interview. SBI Clerk Preliminary Examination Syllabus: SBI Clerk Preliminary Examination (online) consisting of Objective Tests for 100 marks will be conducted online. This test would be of 1 hour duration consisting of 3 Sections. Adequate number of candidates in each category as decided by the Bank (approximately 10 times the numbers of vacancies. subject to availability) will be short listed for the Main Examination from the list of all candidates arranged in descending order of aggregate marks scored. No minimum qualifying marks for individual subject as well as for aggregate (overall) are prescribed. The paper of SBI Clerk main examination (online objective type) would have questions from areas like General Financial Awareness, General English, Quantitative Aptitude and Reasoning Ability& Computer Aptitude. Each test will have separate timings. SBI Clerk Provisional Selection (Subject to qualifying specified opted local language). The marks obtained in the Preliminary Examination (Phase-1) will not be added for the selection and only the aggregate marks obtained in Main Examination (Phase-II) will be considered for preparation of the final merit list. Provisional selection will be made on the basis of candidate's performance in the test (main examination). II) Qualifying in test of specified opted local language, where applicable, as detailed above. Results of the candidates who have provisionally qualified for selection will be made available on the Bank's website. A wait list of upto 50% of vacancies (State-category wise) will be maintained. Candidates will be released from this waitlist on quarterly basis against non-joining and resignation out of the current batch only, subject to the candidates securing minimum qualifying marks as may be stipulated by the Bank for selection. This wait list will be valid for a period of one year from the date of declaration of final result. Application fee & Intimation Charge: SC/ ST/ PWD/ XS- Rs. 100 ; General and OBC- Rs. 600. Candidates will be required to register themselves online through Bank's website. Online registration of application and payment of fees. State Bank of India (SBI) has released official notification for recruitment of Junior Associates (Customer Support and Sales). The recruitment to the clerical cadre post will begin ... With more than 8000 vacancies open for recruitment, SBI has come up with one of the biggest recruitment of the year. Bank job aspirants should not miss this opportunity. Online registration will begin on .. and will continue till ... Details of the recruitment is available at the official website of the bank at sbi.co.in. While applying candidates should apply for vacancies in one State only. SBI Junior Associates Recruitment Online Registration Process: Candidates shall have to apply online at the official website of the bank at sbi.co.in. Valid email ID and mobile number are required for online registration as the bank will communicate every detail of the exam, result and exam dates to the candidates by email and/ or SMS. Before going for online registration candidates must also have scanned copies of photograph and signature in the required dimensions (details of which are given in the official notification). After logging into the registration portal, candidates will receive a provisional registration number and password, which they can use later to fill in the incomplete application form. The login credentials can also be used to edit the particulars of the application if needed, but only thrice. After the submission of application, candidates shall have to submit fee by using debit card/ credit card/ internet banking. Candidates can take a printout of the e-receipt and application form, as well.